If you are looking for stylish jewelry and accessories for tweens, teens and even adults then I highly recommend you hurry over to check out all of the neat products available at Love My Gems. 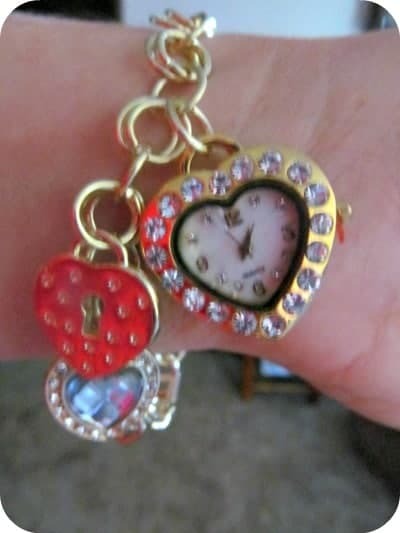 I love the Heart Shaped Charm Watch Bracelet ($26.99) which is both stylish and functional. I love the way the charms give this watch extra flair and it works with both casual and dressier styles. It is made of stainless steel, is much more lightweight than it looks and has a secure clasp. For the tweens on your list there are lots of great gift items for spec ial occasions. A few of my favorites that I found on the Love My Gems website include the journals such as the “Hey Girl” journal and the cute “Whatever Monkey” journal ($4.99). There are lots of choices in the Colorful Crystal Bracelets ($9.99) and even Heart Pendant Necklaces ($12.99) to remind your special girl how much she is loved. Teens are sure to love the Faux Fur Totes which are very modern and fun and the Light-Up Diaries ($16.99) are fabulous for girls to record their thoughts and feelings. It is very easy to navigate the Love My Gems website especially when shopping for the perfect gift ideas because you can shop by tween, teen or ladies or sort by product category and price point. It makes for a pleasurable and simple shopping experience and I like that the products are of a nice quality and priced attractively for most budgets. You are invited to visit the Love My Gems website to browse the entire selection of jewelry, handbags, diaries and journals and accessories available for girls of all ages! Connect with Love My Gems on Facebook and Twitter too! I really like the heart shaped clock. I also like the Blue Fabric Necklace. I really enjoyed looking at all the different items. I may have to check it out again! That bracelet watch is so unique. I just love it. This bracelet is perfect for the Valentine’s Day holiday and the watch is so cute . Whenever I get a piece of jewellery with rhinestones I take a bit of clear nail polish and brush it over them. It helps to keep them from falling out. I love charm bracelets and the fact that it doubles as a watch is amazing. Thanks for sharing! That is a cute watch,my niece would love it.